It’s another Breaking Bad Sunday so what better than a beer with the ultimate yeast that broke bad… Brettanomyces. I’m always up to try a new yeast in my beers. In fact back when I entered a lot of competitions (and was actually winning) [KIDDING] one of my not so secret secrets was using a limited edition strains. I liked these strains because I always felt it added a nice layer to the beer that some judges wouldn’t be used to tasting while still being very style accurate. It was a very simple change, but an effective one. Wyeast Labs and White Labs both have limited edition ‘series’ that see new yeasts every few months. 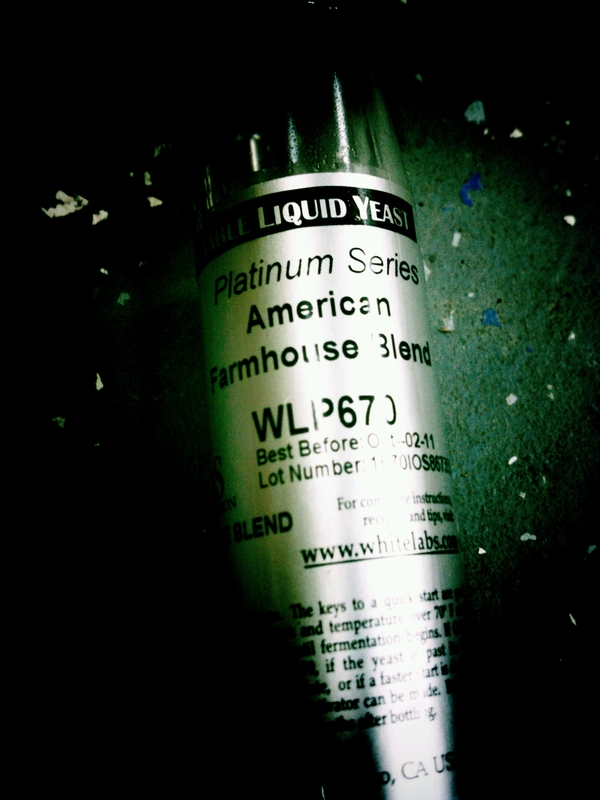 In May White Labs released WLP670 American Farmhouse Ale. This Saison and Brettanomyces blend is rumored to be from Tomme Arthur’s brewery “The Lost Abbey”. 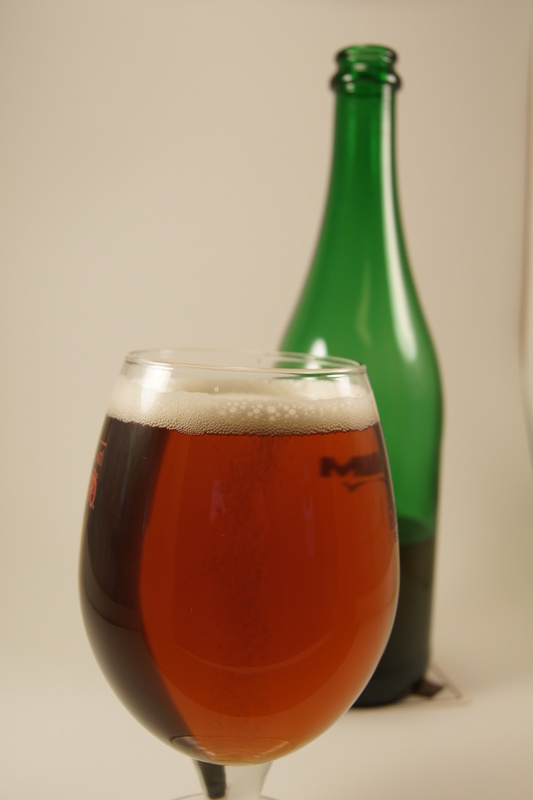 I brewed this beer at the beginning of June and bottled it about 12 days ago. It spent a little over 90 days in primary. I followed my typical Saison fermentation profile: Pitch at 64 degrees, hold for 24 hours, self rise to 70 over 48 hours, hold for a day, let it rise to whatever temp it gets to over 2 days, on the 6th or 7th day apply the heat wraps and bring it up into the low to mid 80’s for 4-5 days, lastly room temp until cold crash/ packaging. I really liked the way the Brett turned out in this beer. If I was weighing the Saison yeast vs. the Brett I would say it’s 55% Brett to 45% Saison yeast. A damn nice balance for a Saison. Just enough of an expected flavor, slightly more of a specialty flavor to set it off right. The Brett flavors were more along the lines of leather, cherry, and green apples. If a Brett Saison has ever been on your brewing radar this is the blend to start with. It’s easy, it’s a great blend flavor in the finished product, it’s less expensive than buying a Saison strain then a Brett strain and most of all it simply tastes GREAT! I really hope this become a regular in White Labs Platinum rotation. If you liked it or you would like to try it next go around please email them. That’s the only way they know people want to buy their special releases. It really does work. Too weird. I found a vial of the WLP670 at All Seasons in Nashville a few weeks ago and snagged it up to try out. Today I’m brewing a Saison with it! Going to try something a little more simple as far as the grain bill is concerned though. I just got a new sack of Dingeman’s Belgian Pilsen and I’m dying to try something with it. I’m thinking of keeping the grain bill pretty simple with just the Pils malt and some wheat. I’m going to let this one set in the fermentor a little longer than the Bam Biere but do you have any other suggestions? Also, why do you only apply the heat wrap for 4-5 days? Is there any dis/advantage to leaving the wrap on longer? Thanks! @B.Webb- Glad you found a vial of the 670! It’s good stuff. I’d definitely make a starter since it’s been in their fridge for 4 months. The viability rate of the Saison yeast and the Brett has probably dropped off quite a bit. I’ve done a 80% Pils, 20% wheat Saison before and it turns out great. A simpler grain bill works great in a yeast driven beer. Sometimes the beautiful yeast flavors and aromas can be lost in a complex bill. I needed to use up some extra grains I had sitting around so thats why mine had more than I would normally use. A suggestion on this yeast strain? Let it go for atleast 3 months before you taste it. It’s going to take some patience but you will be happy in January when it’s done. chracter in around 100 days. Hope this helps and I hope I get to try one of your Brett Saisons this winter! Great timing on this article. I was just considering brewing a batch of my blueberry saison, except with some critters this time. I want to bottle in some Belgian bottles with corks and cages, as it looks like you’ve done here, but I’ve never corked before. Any suggestions? Before I got into Caged and Corked bottling in Summer 2010 I probably hadn’t bottled an entire batch since 2008. Just bottled off the kegs for comps and gifts. I love C&C bottling though. My best advice would be to get a floor corker http://www.rebelbrewer.com/shoppingcart/products/Floor-Corker-%252d-Portuguese.html and don’t skimp on the corks. Buy the good Belgian 25.5mm X 44mm corks. I don’t boil my corks, I just throw them in the same bucket that has my bottle sanitizing water in it. I do follow the wine route and lay the bottles down for 3 days after corking then they are stored upright after that. Good luck, C&C bottles look nice and are alot of fun to open. I just C&C’ed my first batch of Belgian Blonde. It’s certainly nice to open those bottles. Why exactly do you lay them down for 3 days? I thought that the soak in the sanitizer would be enough to get the corks wet to make a seal? It’s a habit I got into a few years ago from wine making. Since I use the “REF” corks its probably not needed. Also when I set them up right the priming sugars and yeast get mixed back up hen they fall. Could I skip all that and be fine? Probably. I have some questions for you about a Saison I’m going to brew soon. I’m planning on brewing a Brett saison based on the recipe Tomme Arthur put out in the White Labs bulletin for the Saison Blanc, with some hop modifications. I am planning on doing a 10 gallon batch but splitting it between the WLP670 and WLP566. 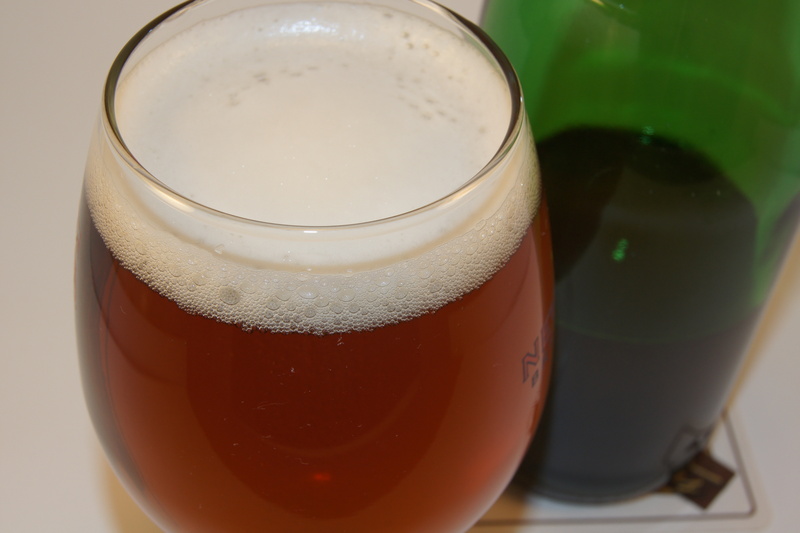 When looking at his recipe I can see that it’s designed to maintain body in the face of the Brett addition and uses quite a bit of Wheat, Rye and Oats. I wonder what you think about how this beer will do my non-Brett portion? I’m curious if you think it’ll end up too full for a really good saison? Also, I’m curious about your process for Brett Saisons. When I look at you fermentation regime you say you leave it in primary for 90 days. Is that at ambient temps? Ferment starting at 64 degrees with rising temps slowly to 78 over one week. Then I’ll let it sit at warm temps for a bit and then aged the Brett portion for about 90 days. The other I’ll probably keg/fine to put on draft sooner. I somehow missed this question Nathan. I’m really sorry and hope its not too late… But my thoughts are the non Brett version will be plenty dry and not have as much body as you think it might. The 149 mash temp will dry this beer out fairly well. Yes I usually leave the Brett Saisons at whatever ambient temp is. My garage where I ferment doesn’t drop below 55 in the winter. I have on occasion put the heat wraps on the carboy to keep a good fermentation going. Did you get any pellicle during fermentation? 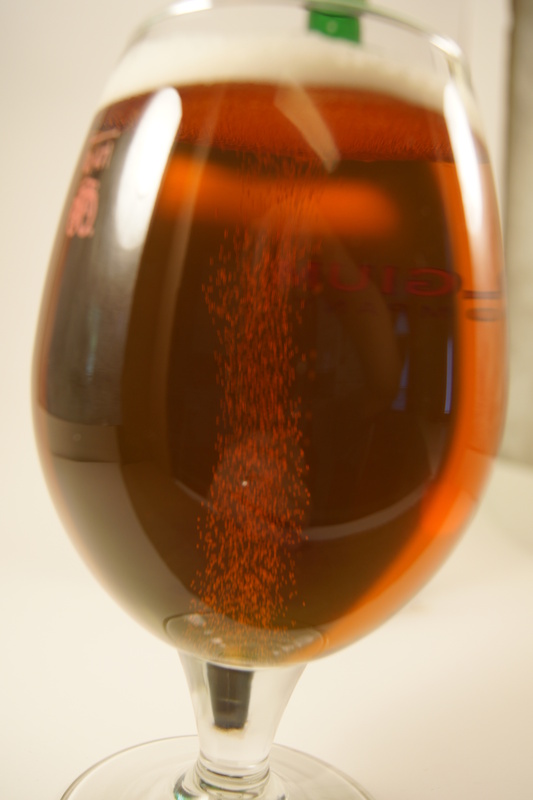 I’ve had my saison in the carboy for about 2 weeks now and it has small white chunks floating on top of the beer. Not really. My last one with the 670 just fermented like a “normal” beer, dropped krausen then sat for 3 months but was plenty bretty. Its kind of har dto tell in the picture but it almost looks like proteins. Whats the gravity reading and how does it smell? Inspired by this site/post I have brewed a saison using the 670. I followed a similar fermentation schedule as you detailed above, and I am now two weeks in and the temp is back at 70F and the gravity is at 1.002. My question is about the extended time in the primary. As a relatively new brewer, I have read a lot of negative stuff about autolysis and have never left anything in the primary for more than aabout 3 weeks. By leaving this in the primary for 90 days will I not be subject to the off flavors caused by autolysis? Your thought and advice would be appreciated as this one tastes good so and I would hate to mess it up. The effects of Autolysis in homebrewing are overblown, especially in wild/sour brewing thanks to the Brett and bugs. I would not worry about leaving the beer in primary. Look at what many pro brewers do when the barrel ferment….sometimes those beers sit for many months. I just bottled my Brett Saison brewed using this yeast blend. I let it sit at room temps for about 90 days and am very happy with the result. I filled an old soda bottle and force carbonated a sample to enjoy now. Its got a strong barnyard nose and a slight acidic tangy flavor that pairs well with the subtle Saison spice flavors. I split my brew into two batches using the WLP670 for the funky one and WLP566 for the other carboy. One thing I find interesting is that the funky batch is slightly darker in color than the WLP566 batch. Also, the white pepper flavor was very noticeable in early batch and basically not detectable in the funky one. Awesome news! Glad the beer turned out for you! seems im a little late to the party, but here i am so here’s my question. what yeast did you use to bottle? I didn’t use a different yeast. I felt like there was enough still “hanging out” to carb up the bottles. The bottles carbed up to around 3 volumes. Brandon, when you prime your beer, do you just use the standard calculator to determine the right amount of priming sugar or do you use a bit less priming sugar since the Brett might still be working in the bottle? Brandon, found your great article on Brett Saison. Looks great. Do you have a list of these in lbs by any chance (for a 5 gal batch)? I post the recipes in % of grain since my batches are much larger than 5 gallons. But I don’t mind posting the weight amounts for a 5 gallon batch for you. I can’t do it today, but will probably have it posted tomorrow. Thanks! I like Castle Pils or Franco-Belges Pils, Weyermann Munich (I think its around 8-10L) and Rhar White Wheat most of the time on my recipes. I have a batch of my saison with WLP670 sitting in a corny (at RT) for about a month now, 1.060 down to 1.010, with cara pils and what for the brett to chew on. The corny is really to allow a secondary, I also added some sugar (60g/20l) to help the brett flavour develop and as it’s a corny I had to seal the lid with some CO2. I tasted it at the week end, it still quite neutral with something possibly in the background. Just wondering should I release the CO2 from the corny or will this help stress the brett and developed flavour and after a month any I expecting too much too soon? So I’ve been thinking about getting into oak fermentations, and have an old whiskey barrel that has seen a few batches and is pretty well spent a this point. Do you think a primary fermentation for this beer in that kind of barrel would lend itself to this recipe? Yep, I think it would make a nice beer. We have a few Brett beers in Whiskey oak at Yazoo that are tasting pretty good. I would make the suggestion to just primary in glass or a bucket then age in the whiskey barrel. Great post! A couple of questions : how long total? Do you suggest a 1 month process or is it too short? Also, what about last phase on room temp. How long and what temp? My Brett beer times are usually at least 90 days…1 month isn’t really enough time in my opinion to develop enough character. It can certainly develop in the bottle or keg though granted you have reach a final gravity of below 1.004 and you don’t store it cold. I want to brew this up on the 30 May for a Homebrew Contest in Aug when shoud I bottle it ? How did the Amarillo turn out in there? Ok what about adding fruit after a few months ? Brandon, I have my brew in a carboy in a closet that will be in the 64 degree range to age. Is that temp ok for aging and for the brett to work? I just did a saison using this yeast…should I let it in the primary for 90 days without any secondary fermentation? Or can I rack to secondary after one week as usual and then forget about it for 90 days?